The retina is the light-sensitive tissue lining the back of our eye. Light rays are focused onto the retina through our cornea and lens. The retina converts the light rays into electrical impulses that travel through the optic nerve to our brain, where they are interpreted as the images we see. A healthy, intact retina is key to clear vision. 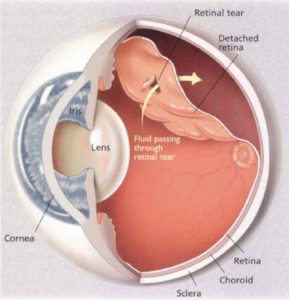 If you have a retinal detachment, you could lose your vision. The middle of our eye is filled with a clear gel called vitreous that is attached to the retina. 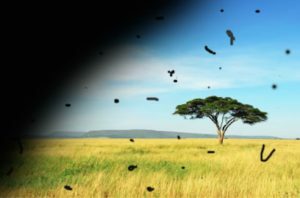 Sometimes tiny clumps of gel or cells inside the vitreous will cast shadows on the retina, and you may sometimes see small dots, specks, strings or clouds moving in your field of vision. These are called floaters. You can often see them when looking at a plain, light background, like a blank wall or blue sky. A posterior vitreous detachment (PVD) is a natural event and occurs in almost everyone as an age-related process. It is at this time, however, that a retinal tear may occur. Usually, the vitreous moves away from the retina without causing problems. But sometimes the vitreous pulls hard enough to tear the retina in one or more places. When a retinal detachment occurs, fluid has moved underneath the retina through a retinal tear, lifting the retina off the back of the eye — much as wallpaper can peel off a wall. The retina does not work when it is detached and vision becomes blurry. This is a sight-threatening condition that requires urgent repair by a retina surgeon. Otherwise, permanent blindness may result.